A geoboard is basically a piece of wood with nails fixed to it in the shape of a square. These nails allow many shapes to be made by an elastic band or a piece of string. 1. 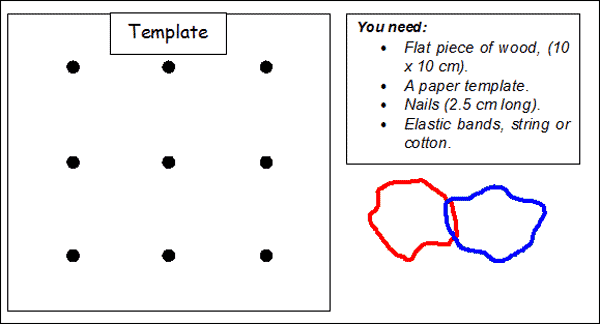 The template is used to make a paper to stick on a piece of wood. 2. The nine nails will then be hammered into the wood using the guide marks on the paper. 3. Your geoboard is now ready for action once you have an elastic band. Try to make some shapes in order to get used to your new piece of mathematical apparatus. Note about different triangles: The dotted triangle (above) is not different. It is the same, but rotated! Different quadrilaterals: The dotted quadrilateral (opposite) is not different. It is the same, but rotated. You don’t need elastic bands – you can draw your shapes on the geoboards (below) with a pencil. Note: What do we mean when we say, different? Triangles are not different if they have been rotated or reflected. If two shapes are congruent they are not different; if two shapes are different they are not congruent. 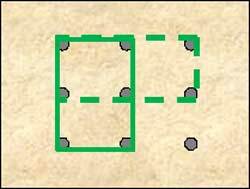 Make many different quadrilaterals as you can on your geoboard? As before, record you quadrilaterals as you make them. Clue: You can make 16 different quadrilaterals on the 9-pin geoboard. 1. How many of the triangles are right-angled (isosceles, scalene or equilateral)? 2. Looking at one of the triangles, how many ways can you make the same triangle on the geoboard? 3. How many of the quadrilaterals are trapeziums? Kites? Squares? Parallelograms? Rectangles? Arrowheads? A Tangram is an ancient Chinese puzzle made from a square. 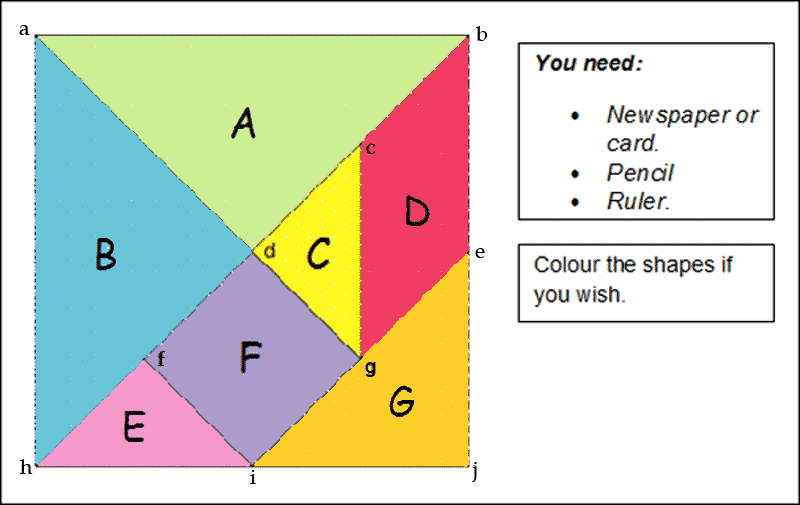 The Tangram is also called ‘The Seven Pieces of Cleverness’, ‘The Wisdom Board’, ‘Chinese Puzzle’ or ‘The Seven-Board of Cunning’. 1. Draw a square on paper. Do not make the square less than 10 cm. Cut-out the square. 2. Draw a diagonal from the top right to bottom left (bh). 3. Mark the half-way point for the right vertical side (e) and the bottom horizontal side (i). Join ei. 4. Draw diagonal aj, but end line at g.
5. Draw line fi parallel to line ag. 6. Draw line cg parallel to bj. 7. Label the seven shapes with letters. Find out about: The differences between; the same, different, similar and congruent.